The Library History Round Table of the American Library Association, of which I am a member, recently posted a link on its Facebook page to an article on the Common Place blog about the Dead Letter Office of the U.S. Post Office Department. The article by Courtney Fullilove, an Assistant Professor of History at Wesleyan University, is titled “Dead Letters – By a Resurrectionist” with the subtitle “Liberty and Surveillance in the Tombs of the U.S. Post Office”. The article tells of Fullilove’s experiences researching the dead letter function of the Post Office at the National Archives for a book she is working on about discarded knowledge in 19th century America. The article is extremely interesting, and it’s always nice to see an article about postal history from the perspective of history scholar. It’s well worth a read. There’s also an older article about dead letters worth checking out on the National Postal Museum’s website. 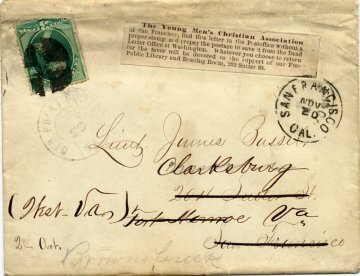 Finally, I have a post on my Library History Buff Blog about a cover in my collection related to a dead letter service of the Young Men’s Christian Association’ Free Library in San Francisco. That cover is shown above. A library is such an itomrpant part of a community. Unfortunately, people just don’t take advantage of their many services. It’s itomrpant to do what we can to support our local libraries.